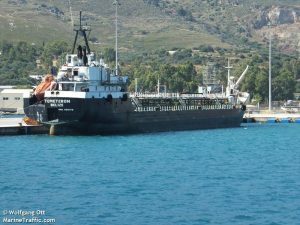 Six sailors – a Russian, four Ukrainians and a Greek – arrested last June when the Russian-owned tanker Temeteron was seized and taken to Zawia on suspicion of fuel smuggling, were released in Tripoli yesterday, the Russian Foreign Ministry has announced. The releases came during the current visit to Moscow by Presidency Council head Faeiz Serraj, deputy PC leader Ahmed Maetig and their accompanying high level political and economic delegation. The two events are not seen as a coincidental. However, two other Russians and a Ukranian, thought to be the captain and his officers, are still being held pending further investigations. Both the Russian and the Ukranian foreign ministries are continuing to secure the release of the remaining three. “It is a very complicated task because of the serious security situation and the instability in Libya,” a Ukranian foreign ministry official said. Last October, three other Russian sailors, arrested when the tanker Mekhanik Chebotarev was seized off Zuwara on suspicion of fuel smuggling, were released. Political diplomacy also appears to have been at play in that instance. Their release came within 24 hours of Ahmed Maetig’s previous visit to Moscow.